If you have found a mermaid’s purse in Ireland, we would be grateful if you could complete the online recording form, including a photograph if possible with some indication of the size of the eggcase. It will take approximately 3 weeks for us to process your sample and we will contact you by e-mail once we have correctly identified your Purse. Thankyou for taking the time to support shark and ray citizen science in Ireland. Your efforts are greatly appreciated! 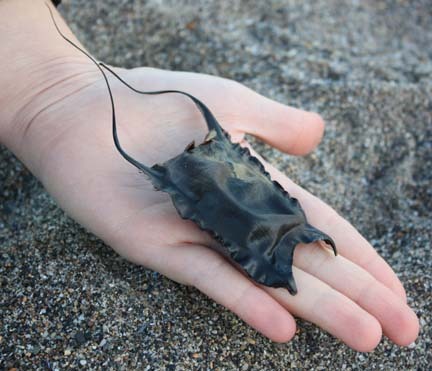 There are mermaid’s purse sightings schemes in other countries too, including the Shark Trust’s pioneering Great Eggcase Hunt in the UK and ELMO, the South African Elasmobranch Monitoring Scheme, so if you have found a shark or ray eggcase in these countries please do report your sightings to the marine biologists there. If you are aware of a sightings scheme that has not been listed here, please do let us know about it and we will add the project details to our site.